In Atlanta Rug repair can now be done by KIWI. 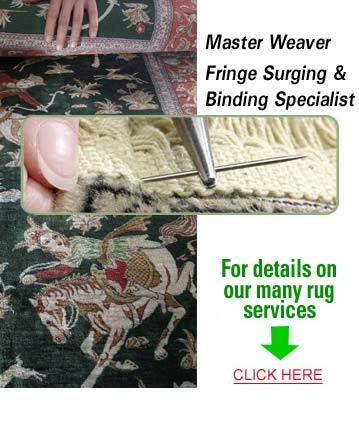 KIWI’s Atlanta rug weaving experts have 30 years of experience working with rug types from all over the world. Just call KIWI to get all the detais 470-375-9711. From Pakistan to Dhurry and Orientals, KIWI provides the detailed repair work necessary to fix your rugs. The decision of whether or not to invest in repairing your rugs depends upon the value of your item and the extent of damage. Some Atlanta Oriental Rug Weavers will fix anything for any price. At KIWI, we do a thorough inspection of your rug. You’ll know whether the investment in repair is worth it before the repair process begins. The types of repairs on fine rugs can range from tears and complete holes to pet stain and odor damage or colors that have faded or bleached. Some rug weaving services in Atlanta may not be able to work with dyes and re-dying processes, so be sure to ask if you decide to call other Atlanta oriental rug weavers. KIWI’s expert craftsman handle this type of work and much, much more. Our KIWI Atlanta rug repair service center provides leading-edge repair work, with time honored craftsmanship. With the large number of homes using wood floors and Tile & Grout cleaning is one of the largest volume services that and Atlanta rug weaving. We want you to see how wonderful your rugs can look again. So get your oriental rug weaving in Atlanta perfected and performed by KIWI. Just call 470-375-9711. “Raymond was an excellent technician, I was so impressed with him. He did a fantastic job cleaning my floors. He answered all my concerns and worked very hard. His efforts were appreciated very much.” Latanya A.